Wouldn’t it be great, if you can publish your own book on world’s best book selling website? Amazon’s Kindle platform enables you to do so. Amazon is one of the most popular plus most widespread publishing platform that enables anybody of become an author and reach billions of readers around the globe. You don’t need to be super freak about computers and learn any language or code for that matter, the process is pretty simple and straightforward. 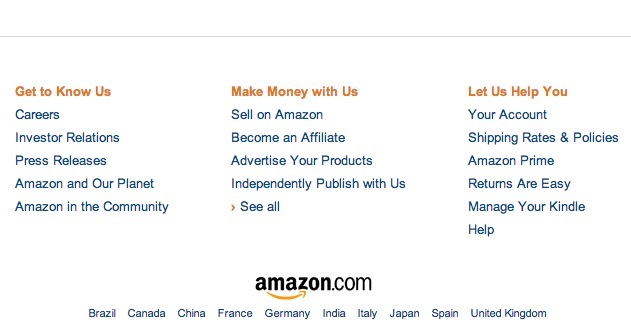 After opening Amazon.com home page, scroll down to the bottom and click on ‘Independently Publish with Us‘. This is first step towards publishing your own work to Kindle. By clicking on ‘Get Started’ you will be able make an new account or use an existing account. It may ask you about additional information, banking details for any royalties you earn, on a quarterly basis. After creating your account, you will be taken to ‘Kindle Dashboard’ here you can add your recent works and also get regular reports on any book sales. 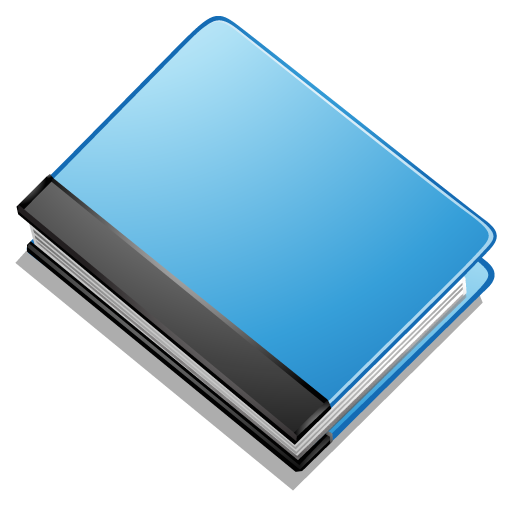 You will need to enter detail information about your book, such as title, authorship, type of book, pricing etc. ISBN number is not at all necessary for using this Amazon service. Going ahead, to target your customers better you need to enter the two main categories of your book. You will find many distinguished categories and you can add more categories in the details page. Their is also space for keywords which can be added, but it has a limit of seven. Although its not a mandatory step but its recommended to add a book cover, Amazon has a tool which is not that lavish but it can help you build your cover. Its always a plus if your cover is well designed and made perfectly according the book. 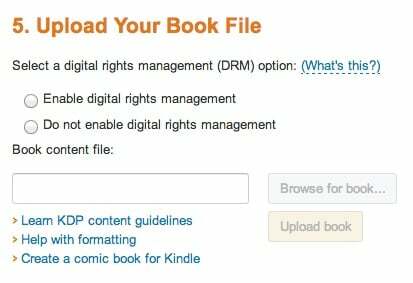 Next step is uploading your book, its fairly easy and the main option here is DRM (Digital Rights Management). It will ask you if you want to enable this or disable. When you enable it, you make your work harder to share and copied plus selling it without payment. Well Amazon manages this very well and its pretty bleak that you will every miss your payment if your book is sold. So, i recommend you to keep DRM disabled, Click on ‘do not enable digital rights management’. Now you can upload your book from your computer. The formats which are allowed on Amazon are : Word (.doc & .docx), HTML, ePub, PDF, Text. After uploading the book, you can look at the preview and verify if your formatting is correct or not. Amazon keeps your formatting and does it pretty well you don’t require any super formatting specialist to sell you book. In many cases book contains lots of images, then you should convert the document in PDF format as it will retain the formatting and Amazon will also complement the format. Preview your book with ‘Online Previewer’ to see how will it look on different devices as Amazon has a drop down menu which will give an insight of different devices, how it looks on Kindles, iPhones and iPads. With Amazon you will be able to set a price as you wish for your work. There are two options when it comes to royalty : 35% or 70%. And i am sure you will select the later option, to get the maximum earnings. What’s the difference ? With 35% royalty their is no delivery charge. You will have pay the taxes and all yourself, there will be no deduction on that from Amazon. Another option with book selling is to opt for worldwide option and selecting only certain countries. It will take about 24-48 hours before your book is live and available for sale. Do remember to fill out the Amazon Author page, where you write about your bio with listing.